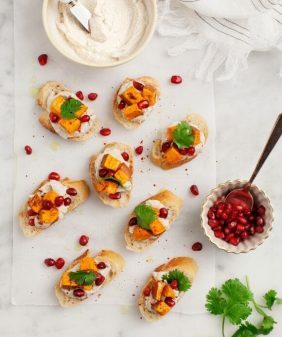 A simple Yogurt Flatbread is served alongside a spicy, sweet, and smoky Vegan Sweet Potato Hummus. 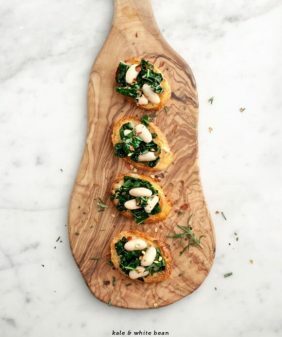 Perfect for a fall or winter appetizer or snack. Today the other “component” is this smoky sweet potato hummus, as my contribution to The Food Matters Project. 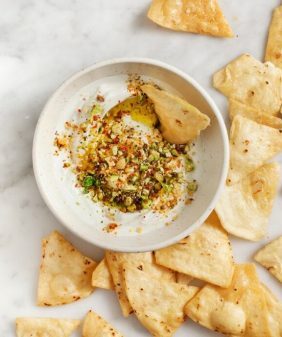 Erin from one of my favorite blogs, Naturally Ella, chose this week’s recipe – a simple “blank canvas” homemade hummus. Delicious on its own… but the choices of flavors to add are endless. I made some sweet potato veggie burgers the other night (post coming soon), and I had half of a mushy baked potato in my fridge so the decision made itself. This is a little sweet, a little smoky, a little earthy and a little spicy. I would say my recipe combination here is on the medium side, but feel free to punch up the paprika and cayenne to make it more bold… taste as you go and adjust as you wish. For the original recipe, visit Naturally Ella. For countless other variations, click here to see what the other members came up with. Make the yogurt flatbreads: Combine the flour, yogurt, baking powder, and salt. Mix together with your hands to form a ball of dough. Add more flour if you need to, just enough so it's not too sticky. Knead for about a minute until the dough is smooth. Put in plastic wrap and refrigerate for at least 1 hour or up to a few days. Divide into 4 balls and roll them into flat disks with a rolling pin. Heat a skillet over medium heat and add the oil or butter. Place the flatbreads in the pan and cook for a minute or two on each side like you would cook a pancake. Flip when you start to see bubbles, and remove when they’re at your desired level of browning or char. Serve immediately; they’re best right off the skillet. If you want to make extra for later, I would keep the raw dough balls in the fridge and cook as needed instead of making them all at once and storing them. 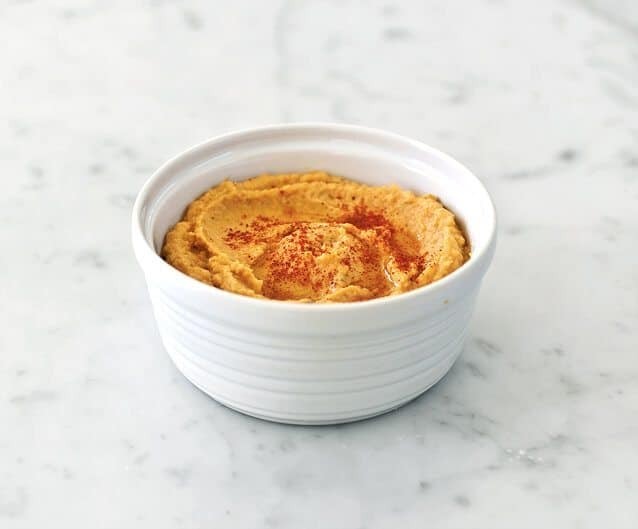 Make the sweet potato hummus: Process the sweet potato, chickpeas, tahini, maple syrup, garlic, salt, paprika, rosemary, lemon juice, pepper, and cayenne, if using, in a food processor until smooth. Taste and adjust seasonings to your liking. Garnish with a drizzle of olive oil and a dusting of paprika. Serve with the yogurt flatbreads. 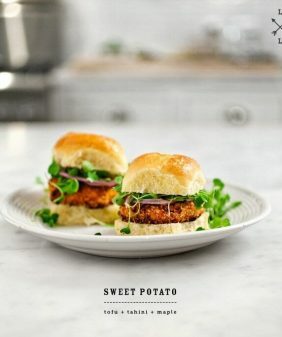 I love the sweet potato addition! Never would have thought of adding that in hummus. 🙂 Your pictures look so elegant… love it! #1—Have I told you I love your blog? #2—Lets trade naan for flatbread. mmm…sounds delicious! i’ve never made flatbread before, but may have to take a stab at it! Thanks for sharing the flatbread recipe! I am always on the lookout for easy homemade breads and this one looks fantastic! I gave my stepmom Plenty for Christmas and we’ve cooked a couple of wonderful things from it together so far. It’s a great one! The flatbread looks awesome. I am such a wimp when it comes to making breads. I also made a sweet potato hummus this week but bean free! 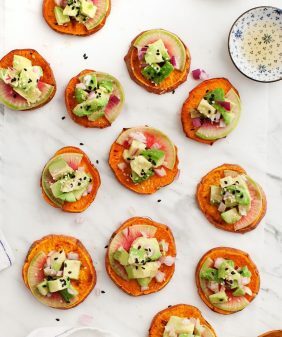 I love the addition of the sweet potato, and your beautiful photos! And now I really want to make this yogurt flatbread. I’ve had that yogurt flatbread recipe dog-eared in Plenty for months. I’ll be making that tonight to eat with the leftover hummus. Love your addition of sweet potato to the hummus. the ottolenghi flatbreads are a favourite here! and now we have something new to pair them with. how gorgeous! just found your blog, and wow, so lovely! Those flatbreads look so appetizing. I have the Yottam book – will be sure to look them up in it. I looooove sweet potatoes! This looks awesome. Thanks for sharing the flatbread recipe too! I’ll have to keep that on hand. There were so many creative renditions this week–loved it! The flat bread looks wonderful and so does the hummus. You guys have an amazing blog and I am so glad to be a new follower! I seriously love flatbread and can’t wait to try yours! I made sweet potato hummus earlier this fall, it’s one of my very favorite variations on standard hummus! I use oat flour a lot also (and it would totally work with these). I seem to trade off between having oat and spelt on hand. I love that cookbook. Your photos are gorgeous. Thanks for sharing a simple and lovely recipe! What a beautiful combination! Can’t wait to try this flat bread. 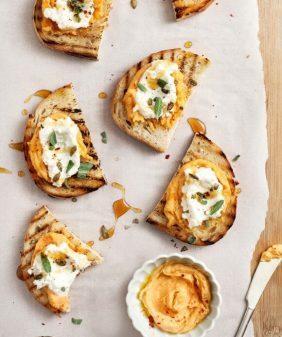 And your hummus – you should enter it in the NC Sweet Potato Commission’s blogger recipe contest! Can I substitute the spelt for rye or almond or rice flour? Paprika – hot or sweet? About the flour – I’m really not sure (I’m not an expert on the science of flours). The original recipe called for whole wheat, I just happened to used spelt and it worked well. Almond and rice are both quite different from wheat/spelt so I can’t really anticipate how the result would be. Oat flour would be a closer substitution if I was going to pick the next closest flour that’s gluten free to experiment with. Thanks for sharing the recipe. I love sweet potato but unfortunately I don’t really like hummus. Is spicy sweet potato gnocchi would taste good for the flatbread? If so, I would try to make it this weekend. Sweet potato gnocchi sounds wonderful, I’m sure the flatbread would be a nice side to it. I made both of these today to accompany Baba Ganoush and they were amazing! So so impressed with the results, I used a little more sweet potato than the recipe called for but it just meant I needed more seasoning to take the extra sweetness out of it. It went down a storm with two very fussy eaters as well! Thank you so much for posting these lovely recipes! I cannot believe that I dit not thank you for posting this recipe yet! This must be one of my favourite flatbread recipes. I enjoy it so much I even posted it on my own blog. I have a batch waiting for me in the fridge right now! Thank you!! 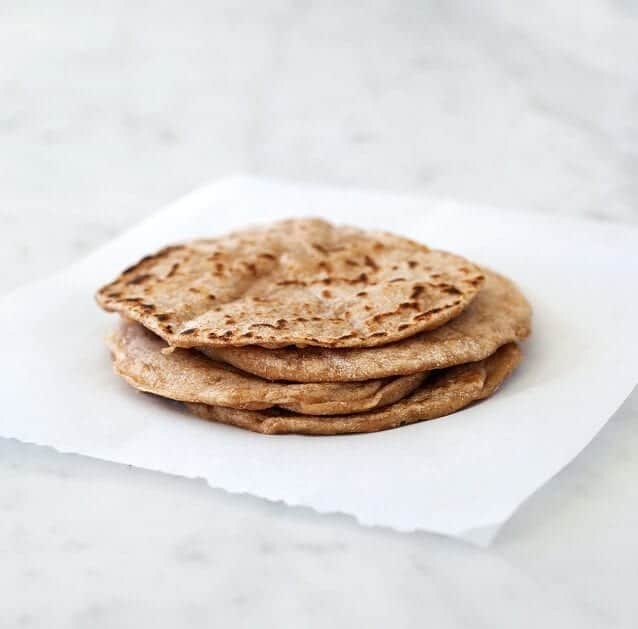 I cannot wait to try the flat bread recipe, I discovered your blog a couple of days ago, and have been back to visit every time a have a spare second since! Really inspiring and beautifully composed!! Thanks so much in advance!! Thanks Jeanine. Super easy hummus recipe. I’m an Ottolenghi fan on Oregon Coast.